When I was a child, 4D cinemas were all the rage. You know the ones, with the seat-rumbling and the spurts of air in your face when something explodes onscreen and the spaceship you and 40 other people are meant to be piloting starts crash-landing into the moon. Well, Whirlwind FX have come up with the PC equivalent of 4D cinema that you can stick on your desk. 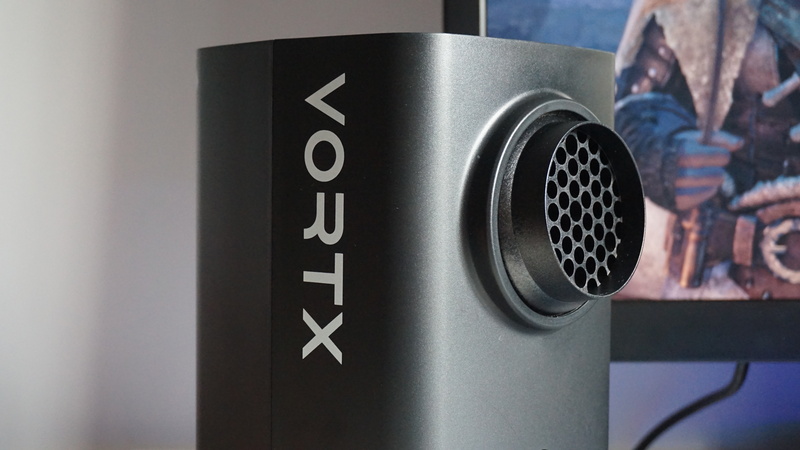 The Vortx, they call it, and this small, speaker-sized doodad is being touted as the world’s first environmental simulator for PC gaming. It does so by essentially blowing hot and cold air in your face for those air-quote worthy goals of “maximum immersion” and “making you feel like you’re in the game” – provided you can still hear the game over the din of its fans, that is. On paper, it sounds like a pretty neat bit of tech. A novelty bit of tech, sure, but neat all the same, especially when Whirlwind FX claim their so-called EX Algorithm, which they’ve developed in-house, works with any game. That’s right. Any game. According to the brief description on the box, the Vortx works by tapping into what you’re seeing onscreen and then matching those images with the sound files that are playing at the same time. Somehow, through some sort of technical wizardry, the Vortx then knows whether to blow cold air in your face, or let out a fiery roar of heat. The idea, in a nutshell, is to “let you feel what you see and hear”, the Vortx box continues, and you could theoretically use it for trailers and films as well as games if you so wished. And work with any game it does. The only problem is that it only really works properly with any game about 50% of the time. You can adjust the Vortx’s fan up and down to make sure it’s blowing at the correct angle. First impressions were certainly good. When I was thinking of what classic chilly scene I could throw at it first, I instantly thought of Rise of the Tomb Raider, which sees Lara trudge through an oncoming blizzard right at the start of her adventure in the mountain peaks of Siberia. As if by magic, the Vortx began blowing a strong, cool breeze into my face right from the off, imitating the whistling winds that were whipping round Lara and her apocalyptic holidaying pal Jonah rather convincingly. If the Vortx also had the ability to cough out fake snow, the illusion would be complete. So far, so good, I thought, but then I loaded up a save file from a little further on the game, where Lara’s skulking through the burnt-out Soviet installation facility, and it all went a bit downhill. Aside from often completely failing to register the heat from burning bits of wreckage I tried standing next to, the FX Algorithm clearly has a hard time understanding which sound effects are actually related to the weather, as every twang of my bow string produced a hot burst of air and an aggressive whirring of its fans. The same thing happened when I scooted down a zipline at the end of the installation down to the valley below. Despite there being heavy snow and a clearly visible wind onscreen, the Vortx remained unresponsive. It got very confused when I went inside a cave and Lara’s hip flare fired up as well, suddenly producing a warm breeze because the screen was filled with an orange glow, which felt very much at odds with the freezing temperatures outside. 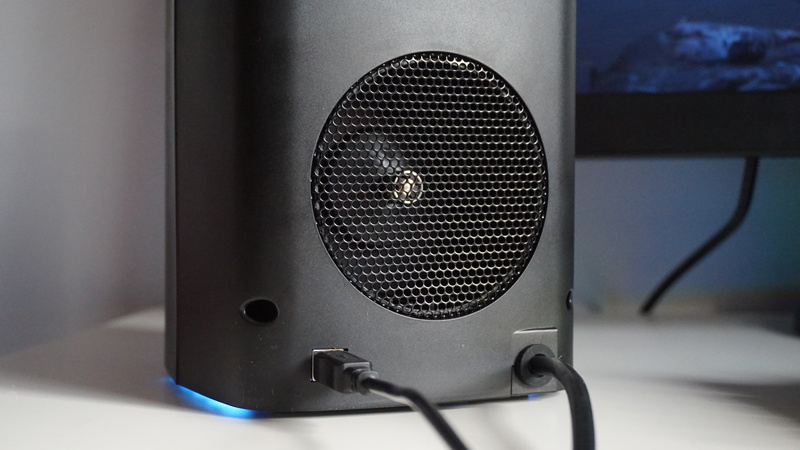 The Vortx connects to your PC via USB, but you’ll need a spare plug socket for it as well. Next, I threw the sunny, Ancient Greek islands of Assassin’s Creed Odyssey at it, although sadly to very similar results. I appreciated the Vortx’s nice, gentle breeze blowing as I trotted around the countryside on the back of my horse Phobos, but every time I opened the map I was accosted by another massive hot ROAARRRR, because apparently Ubisoft’s whooshing menu noises must sound very similar to a fire-breathing dragon. Monster Hunter: World‘s various climes also left me underwhelmed. I realise this might have slightly more static weather effects than most games, but if you’re going to say your wind machine works with all games, then it needs to do a much better job that simply spluttering short waves of warm air in your face every couple of seconds or so. Forza Horizon 4 fared a little better, creating an effective ‘wind in your hair’ type feeling even though, err… you actually spend most of your time sat inside a car. Still, at least you can imagine you’ve rolled the window down or something, right? That said, even here the Vortx proved pretty patchy. In the opening season-off sequence, I enjoyed the light, constant breeze of the autumn and spring sections of the track – even if bombing around in a super car didn’t quite match the Vortx’s blowing intensity – but the snowy winter roads elicited nothing more than the occasional chilly whistle, even though this was the sequence that arguably had the most extreme weather effects. You know it’s a gaming peripheral because there’s RGB lighting on the knob and underbelly. 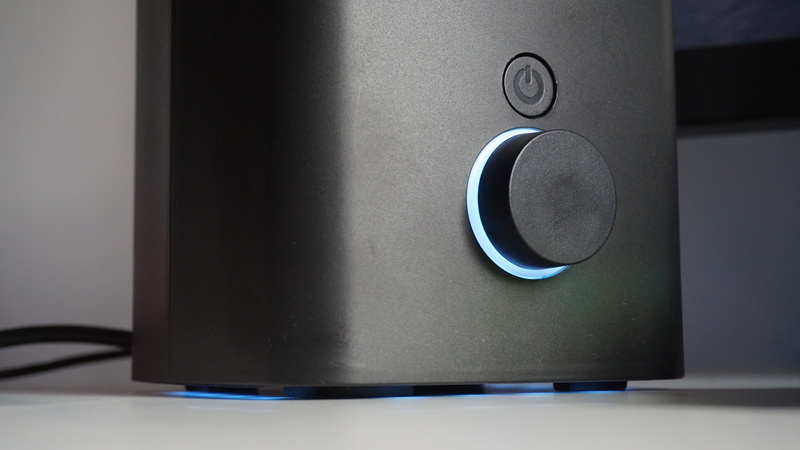 You can also press the knob to switch between the Vortx’s sensitivity settings and heat intensity. For one final test, I deposited myself in the northern mountains of Skyrim. Despite the rain and overcast weather, the Vortx proceeded to whir seconds-long bouts of lukewarm air at me here, which just became increasingly irritating. So maybe even 50% of the time was a little generous in retrospect. And that’s to say nothing of the space heater-type smell it made, or the constant and mildly terrifying electrical buzzing sound it made when it wasn’t even doing anything. It’s also incredibly noisy, making it impossible to actually enjoy your games unless you’re wearing a pair of headphones, and even then you can still hear it humming away in the background. It’s also worth pointing that the Vortx is a US-only peripheral at the moment, and I actually busted an entire unit by sticking it straight into a UK plug socket via a plug adaptor and had to be sent another one. Since it generates heat, the Vortx functions much like a hair dryer when it comes to electrical standards, and thus requires a very specific voltage. Too much voltage and the Vortx’s safety measures kick in, effectively rendering the device null and void forevermore. As a result, anyone thinking of importing one will need a transformer to convert the voltage correctly. Not that I would recommend you doing so, as it’s clear Whirlwind FX need to do a lot more tinkering to their algorithm before anyone thinks of dropping $120 on this thing. It’s simply not accurate enough to even make it a cool, five-minute show-your-friends type thing, and most of the time it’s just too loud to contemplate anything else. It’s an assault on the senses in the worst possible way, and you’d be much better off plugging in a regular fan and pretending you’re in the game that way. Far from blowing your mind, this is one PC peripheral that’s ultimately just a load of hot air. Tagged with feature, Hardware, hot diggity, mega chill, simulator.